Now an official registered breed, the Chincoteague Pony is a wild pony believed to be a descended from survivors of a Spanish galleon shipwreck off the coast near the Maryland and Virginia state line. Divided into two herds now, one heard lives on the Maryland side of Assateague Island, while the other heard lives on the Virginia side. Assateague Island National Seashore, established in 1965 as a unit of the National Park System, encompasses close to 48,700 acres of land and water and extends from Virginia into Maryland. The Chincoteague National Wildlife Refuge, located in Virginia and managed by U.S. Fish and Wildlife Service, and Assateague State Park, Maryland's only oceanfront state park, are located within the Assateague Island National Seashore boundaries. The Maryland herd is free-roaming and may be seen anywhere in the park. Since 1968, they have been owned and managed by the National Park Service. In order to maintain a healthy environment for the horses and to protect the other park resources, the National Park Service manages the horse population by administering a dart vaccine each spring to prevent pregnancy in selected mares. The goal is to keep the herd size to fewer than 125 horses. The Maryland entrance to Assateague Island National Seashore is at the end of Route 611, eight miles south of Ocean City. The Barrier Island Visitor Center is located on the southern side of Route 611, before the Verrazzano Bridge entrance into the park. Open year round, except for Thanksgiving and Christmas, from 9 a.m. - 5 p.m. The Virginia herd is owned and managed by the Chincoteague Volunteer Fire Department. By a special use permit issued by the U.S. Fish and Wildlife Service, the horses are grazed in two designated areas on the Chincoteague National Wildlife Refuge. The permit allows a maximum herd size of about 150 adult horses. The Virginia entrance is at the end of Route 175, two miles from Chincoteague. The Toms Cove Visitor Center is located on the south side of Beach Road, before the beach parking areas. Hours and open schedule varies seasonally. In order to manage the herd size, most of the Virginia herd foals are auctioned during the annual Chincoteague Fireman's Carnival, Pony Swim and Auction. 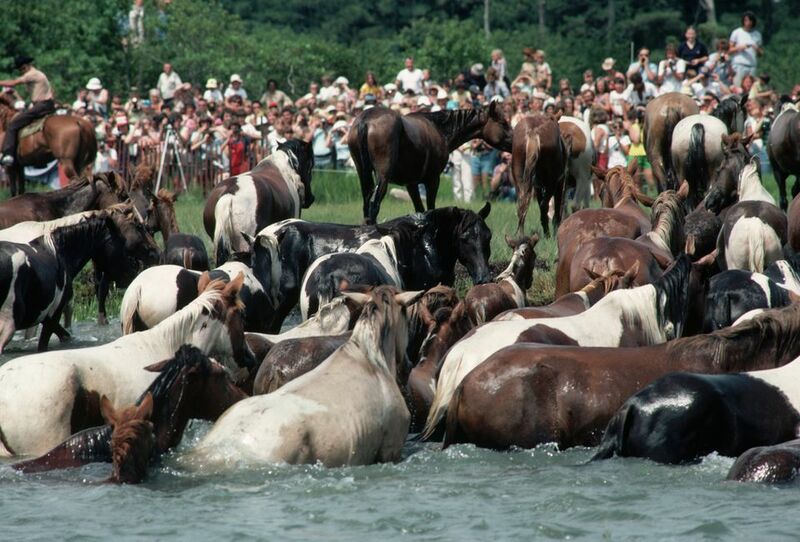 The world famous event, always held on the last consecutive Wednesday of July, attracts as many as 50,000 spectators each year to watch the salt water round-up and pony swim across the Assateague Channel. The exact time is different each year. The swim happens during what is known as slack tide, the brief time between tides when there is no current. There is an auction that happens on Thursday, the day immediately after the pony swim. The proceeds from the auction go to support the Chincoteague Volunteer Fire Company, which also includes care costs for the wild horses throughout the year. Be careful what you do with your hands around the auction. You do not need to register to participate in the auction and a raised hand will be considered a bid. You might just bring home more from vacation than you anticipated.